Students from different schools and colleges, BJP and its youth wing Yuva Morcha have celebrated successful launch of 104 satellites into the orbit on PSLV C-37 rocket from SHAR Centre at Sriharikota on Wednesday. Rajamahendravaram City MLA Akula Satyanarayanaand others celebrated the success by bursting crackers at the MLA’s party office and distributed sweets. In Tapeswaram, students of Sri Polisetty Sattiraju Srimati Bhushanam ZP High School have designed a replica of PSLV C-37. Students of Sri Gowthami Smart School, The Future Kids’, Prasad Public School, Aksharam Public School and Prathibha School also celebrated the event. GIET, Rajiv Gandhi Group of Institutions, Aditya Degree College, Rajamahendri Degree College for women, SKVT and others also celebrated. 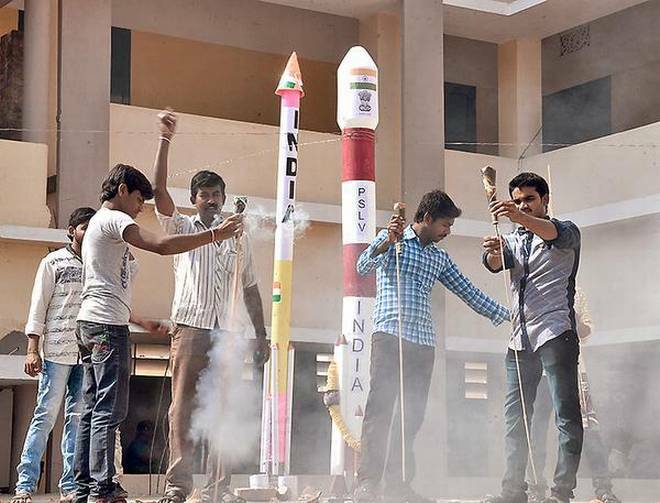 The launch is a milestone in space technology in the world, Koduru Harinatha Reddy, correspondent of Nehru English medium High School, at Banaganapalle in Kurnool district said. In Kadapa, Pushpagiri School correspondent M. Vivekananda Reddy, principal P. Harikrishna and students congratulated ISRO scientists for creating history.